While the polar vortex was yesterday’s news, for much of the United States, the dead of winter means more snow, snow, ice, and more snow. Many residents are stocking up on salt for their sidewalks, and cities keeping roads safe by sending out plows and salting the streets to prevent the snow and ice from freezing over. Unlike the salt you would use on your sidewalk, the city trucks you see down the highways spraying the road with a salty solution are treating roads to prevent freezing rather than trying melt the ice after the fact. It all boils down to the chemical properties of salt and how it reacts with water at its freezing point. 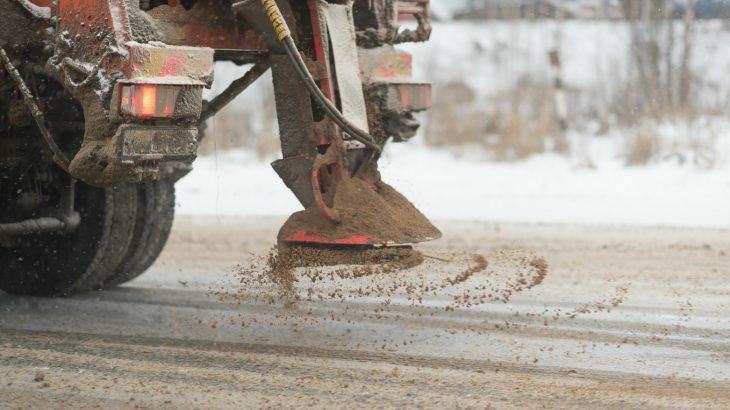 Julie Pollock, an Assistant Professor of Chemistry at the University of Richmond, explained the chemistry of road salting in a recent piece for The Conversation. Sodium chloride (NaCl) is salt no matter which way you shake it, but the salt on the road is less pure and gets its brownish color from mineral contamination. Water freezes at 32 degrees Fahrenheit, and if the ground temperature is freezing or below freezing, ice and snow will form, but salt lowers the freezing point. Salt solutions lower the freezing point to 15 degrees Fahrenheit. But this rule will only apply if the road is pre-treated with a salt-water solution. Salt that’s dumped on the road after a blizzard won’t melt the ice unless subjected to heat from the sun and cars. Sand is also used to help provide friction for road traffic in colder climates where this scientific principle won’t work. Road salt can seep into wetlands, rivers, streams, and lakes and pollute ecosystems. Sidewalk salt can also be harmful to pets, and there are some pet-friendly options for sidewalk salt that concerned pet owners can use for their walkways. However, some eco-friendly alternatives are being explored to replace road salt solutions, and these still use the freezing point depression principle, according to Pollock. Some of the alternatives include brines and beet wastewater from sugar beet processing. Like salt, the sugar lowers the melting point of ice when sprayed onto the road and beet wastewater has less of a negative environmental impact. What’s more, brines, beet wastewater and even molasses additives could be effective in lower temperature climates. These are also not without their potential consequences though, which is why some researchers are looking to replace road asphalt with solar panels in the hopes of making self-clearing roads, according to another report from The Conversation.